“Mehdi Khazali has been left in a 2 X 2 meter cell along with a person of Bahaei faith since his arrest. He has not been interrogated yet and none of the interrogators or the Judiciary officials have visited him yet.” says one of Dr. Khazali’s friends. Dr. Khazali, a blogger and political activist has been in detention since July 18, 2011 and according to close associates has been on a hunger strike since. 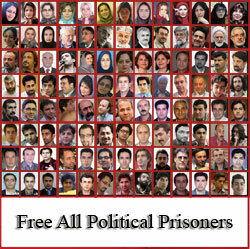 Dr. Khazali’s family visited him in Evin prison last Thursday. A close associate tells Rooz, “Despite the fact that Dr. Khazali has lost a lot of weight and looked very weak, he said he will remain on his hunger strike. Mehdi Khazali was arrested on July 18 after being summoned to Intelligence Ministry. He was attacked and assaulted in front of his teenaged son and then taken to Court. A close associate told Rooz: “When they took him to Court, his son and few close friends were present. The Judge explicitly said that the charges attributed to Dr. Khazali are the same charges that were brought up in the last Court session which he was exonerated for on all charges. The Judge said that because he was exonerated of all of those charges, a warrant for arrest is no longer valid and he will order Dr. Khazali’s release. The friend added, “Dr. Khazali told the Judge that he will go on a hunger strike and will leave his corpse on his shoulders. In fact, Dr. Khazali’s hunger strike is to protest his illegal arrest and detention. His hunger strike still continues and we are very concerned about the serious harm that it may cause to his health, for we know that the won’t break his hunger strike. According to close friends, Dr. Khazali was first in a cell with a drug trafficker and now is in a cell with a a person of Bahaei faith. This person close to Khazali’s family said, “The case of Dr. Khazali was first being handled by the Deputy Clerical Affairs in the Intelligence Ministry. Whereas, the political activists cases are handled by the Security Affairs of this Ministry. Dr. Mehdi Khazali is the son of the ultra conservative member of the Assembly of Experts, Ayatollah Khazali whom in a statement denounced his son last year. Last year Dr. Khazali was summoned and arrested by the Special Court for Clergy when in fact this Court only legally can summoned and arrest the clergy. Dr. Khazali was arrested last November but was later released on bail but now has been rearrested and his case remains in limbo status. Dr. Khazali is an ophthalmologist and is the Director of Hayat Publication. On his blog he often criticizes the current state of affairs in the country and also criticizes the responsible officials.